Odors in wastewater ponds or lagoons may seem inevitable, but many odors are actually signs of a larger problem and can be avoided. When odors reach levels that result in complaints by neighbors, it’s almost always a sign that something in the treatment process is not working right, and fixing that issue will naturally result in a drop in odors. Uncovering why the they originate is the first step to lagoon odor control and prevention. As a wastewater pond ages, sludge begins to accumulate on the bottom. This sludge is composed of forms of BOD that the bacteria were not easily able to digest, mostly insoluble BOD. Eventually this insoluble BOD sinks to the bottom, where it combines with dead bacteria, live bacteria, and small amounts of inorganics to form a sludge layer. This happens at a faster rate in cold climates where several months per year the bacteria are digesting material at a fraction of the rate they normally do. As sludge builds to 12” or more in thickness, only the upper inch or two remains oxygenated, leaving the rest of the layer anaerobic. Anaerobic environments are hotbeds for odors and this is where the significant lagoon odors are generated. Small amounts of those odors begin to rise out of the sludge and through the water column, ultimately making it to the atmosphere. The thicker the sludge blanket, the more odors are generated, and the more they are noticed by people in the lagoons vicinity. And in many climates a spring turnover of the water column will accelerate the rise of those odors. Our first focus for preventing odors is always to reduce sludge thickness, and prevent new accumulations, with our VitaStim Lagoon Line. Vitastim Polar, VitaStim Sludge Reducer, and VitaStim Summer Slam, are developed to work with the changing water temperatures throughout the year to reduce sludge and prevent new sludge accumulation. For odors generated within the anaerobic layers of sludge, our VitaStim Lagoon Line (above) contains sludge-eating bacteria that remove the excess sludge and eliminate the environment the odors grow in. 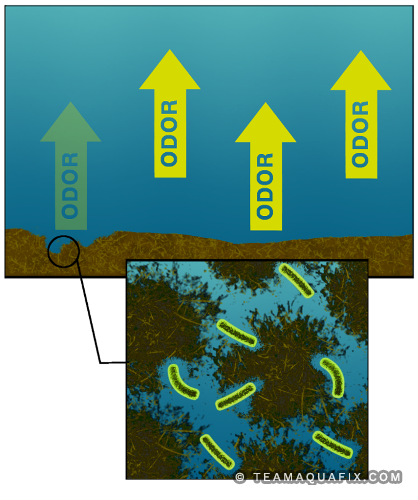 Odors can also originate as soluble organics and BOD are digested in the water column. This is most common in the summer when bacteria are at their most active. The active bacteria populations demand more oxygen, and may overwhelm an aeration system. This can happen during the warm months, even if the aeration system is capable of supplying adequate oxygen for the majority of the year. Lowered dissolved oxygen (DO) in the water column allows the same anaerobic processes that occur in a sludge blanket to occur in the water column, resulting in similar odors. To combat this we recommend increasing aeration system output when DO falls below 2.5 ppm. This is not always possible, so supplementing oxygen with our Oxypaks XL is a great alternative. Oxypaks XL will also stimulate native bacteria, and bacteria in our VitaStim Lagoon Line, to consume BOD and boost effluent quality. Odors may also be generated during the breakdown process of complex organics. The bacteria population can’t immediately digest these organics, and instead must first break them down into intermediate compounds, which commonly create odors. For example, long chain fatty acids—common in many influent waste streams in the forms of stearic, palmitic, oleic acids, and more—break down into shorter chain volatile acids which cause odors. 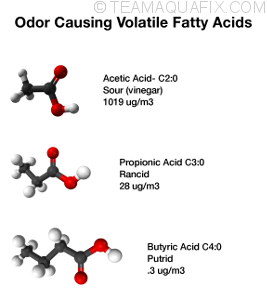 Many of these shorter chain volatile acids have lower odor detection thresholds (they stink more, with less present); such as butyric acid, which is detectible at as little as .001 milligrams per cubic meter. When fatty acids and other forms of BOD are causing an odorous influent at the wastewater lagoon, its best to accelerate the breakdown of these forms of BOD, before they even hit the lagoon. We do this by introducing bacteria and nutrients as far upstream in the collection system as possible. This may be in a lift station several miles upstream, or simply in the influent wet well 50 feet ahead of the lagoon. The easiest way to introduce bacteria in the upstream collection lines is our Bug On A Rope, which contains bacteria and nutrients in a combination that accelerates their activity and digestion rates, to optimize for the shorter treatment windows seen in a collection system. For help with this issue and more, call 888-757-9577 or contact us. Industrial and food processing facilities represent their own unique challenges for lagoon odor control, especially when they are discharging into the municipal lagoon. Many municipal lagoons are poorly equipped to handle the high load that these users discharge. To make things worse, the BOD formed in food processing and industrial waste streams tends to be imbalanced and often has large amounts of one source of BOD. Common sources of BOD from industrial discharge would be large amounts of proteins in a dairy facility, fats in a rendering facility, amines in a chemical production, fibers in pulp/paper, or sugars in the beverage industry. These large quantities of imbalanced BODs overload the bacteria population and throw them out of whack. The result is incomplete breakdown of the wastes, and increases in odors. When possible, we preform a treatability study if industrial waste is part of the odor story, testing a variety of biochemical catalysts that work on the specific components of the waste stream that are present in the largest amount. Introducing fast-acting catalysts to the industrial or food processor discharge can dramatically decrease the waste stream’s strength before it even gets to the lagoon, moving the lagoons influent back to more balanced proportions. A side benefit of this type of treatment is almost always better BOD removal in the lagoon as the bacteria get back to functioning the way they should. The biological approaches described above represent the best long term solutions, and the best bang-for-your-buck in odor control. But when you need to get rid of an odor “NOW!”, you may not be able to wait the 1-4 weeks these approaches often require . A more immediate solution may be required in the short term. This is where we begin to use neutralizing agents, such as Dazzel Eco Plus, and Dazzel Sewer Sweetener. They are both concentrated blends of essential oils. These oils bind with and neutralize malodorous compounds. This doesn’t just mask the odor, but eliminates it. Their only limitations are that they don’t prevent new odors from forming (that’s where the biological approaches outlined above shine). Dazzel Eco Plus is spray-applied over the lagoon surface, and creates a micro film of essential oils that binds with the odors as they rise to the surface. Dazzel Sewer Sweetener is best applied in the collection system to neutralize odors in the influent waste stream. To combat odors due to hydrogen sulfide in the influent waste stream we use De-Sulph-A-Nator, an organic chelation chemistry that binds with sulfides specifically. These tools provide the short term lagoon odor control required when an immediate result is required.